Starting at a very early age Naomi showed entrepreneurial tendencies. After training as a chef and travelling the world, Naomi returned to Australia and wanted to work on the farm despite being discouraged by her father who was contemplating retirement. 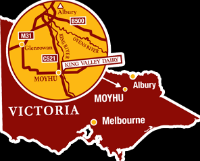 A visit to a friend in north-east Victoria during 2000, however, dramatically changed her direction. While visiting, Brown Brothers offered Naomi three weeks work in their vineyard at Milawa. After the short stint in hospitality finished she moved into vintage and started to expand her skills into other roles. It didn’t take long for Naomi to purchase 80 acres of grazing land and decide this was where she was staying. This led to a call from Stephanie Alexander who asked Naomi to help set up a kitchen garden in Wangaratta at the very first regional school outside Melbourne to participate in the pilot program. Delighted with this new challenge Naomi spent a lot of time over the next year driving around the district getting in touch with farmers and food producers. Ultimately this led to another significant deviation in her entrepreneurial journey. That ‘someone’ was obviously meant to be Naomi who succumbed to a whim and rang the real estate agent. Three weeks later she had secured the lease to an old butter factory and started setting it up as a café. In 2008 Naomi had her first child so it was a relief when her mother moved from the city the following year to help her out in the café at a particularly difficult time. It was clear that something had to change and being someone who doesn’t like to give up, Naomi was ready for the challenge. Recalling her father’s advice to “always stick to the staples,” she contemplated what else they could offer in the large space available to them. It came to her one day while she was working in the kitchen preparing food. Like many Australian chefs dissatisfied with the quality of commercial butter produced in Australia, Naomi was either making her own butter or purchasing it from France. As a result of Naomi’s light bulb moment, The Butter Factory was born in 2010 but it took a good twelve months for her to develop the idea and overcome a few barriers. Sourcing the equipment was a major hurdle given that batch butter making on a commercial scale is no longer a common process undertaken in Australia. Luck was with her when the local food safety inspector was sent a photograph of an unidentified object in a scrap yard. Realising it was a 500 litre butter churn he immediately contacted Naomi who was only too happy to give it a home. Converting from small to large scale production was another challenge. Dairy Australia and the National Centre for Dairy Education were only too happy to help when contacted by Naomi for information but it came down to a lot of trial and error in the early days. Eventually she applied for a Churchill Fellowship and, after the birth of her second child, travelled to France in 2012 to get advice from the masters. Aware of the privilege of being invited into their inner sanctum, Naomi found it fascinating that they could maintain the quality on such a large scale. With the benefit of her trip to France, Naomi returned to The Old Butter Factory, “tweaked a few things,” and started winning awards for the products being turned out. A trophy was snared from the “big boys” at the Royal Melbourne Show followed by a bronze medal at the International Cheese Awards in the United Kingdom up against all the European entries. Gaining a lot of confidence through this successful benchmarking, Naomi used it to every advantage in marketing The Butter Factory. In addition to online sales, regular customers were gained through top end restaurant chains and resorts Australia wide. It wasn’t long before getting up at 3.00am every Saturday morning to attend a Farmer’s Market with two babies in tow was a thing of the past. However, with success comes the new challenge of not being able to meet market demand. Naomi couldn’t keep up with the orders and found herself spending a lot of time dealing with customers instead of making butter. What was a good decision at the time suddenly turned sour when the distribution company went into receivership three months later. Back at square one, Naomi once again had to consider how to best manage the business through massive growth. While the new site, an old dairy factory, at Moyhu was quickly found, raising venture capital was unknown territory for Naomi and her partner David. As well as signing up for an entrepreneurship mentoring program, she sought out the richest friends she knew for advice and access to a network of entrepreneurs and potential investors. A friend with a venture capitalist background mentored her through the process. Becoming a company has been another turning point in her journey. In addition to ramping production up from 2,000 litres to 16,000 litres a week, Naomi also has to produce shareholder reports and manage more staff. With just a hint of relief in her voice Naomi is pleased to report that just about everything is in place now. Production is already underway and they are on track to open up for visitors in the next few months despite a few hiccups with the local shire. “Just because it says so doesn’t mean it is so,” retorts Naomi when recalling stringent requirements for city standard car parking in a rural setting. Common sense prevailed when the alternative given by Naomi was to not open to the public. Rebranding as King Valley Dairy in conjunction with the move to Moyhu has been a conscious decision to enable the business to develop other innovative and naturally cultured dairy products. “We’re currently working with dairy farms in the area to explore a new yogurt product line,” says Naomi. Her partner David’s training as a pharmacist is proving to be most useful in this process. Right from her early days Naomi has always found ways to earn an income and support herself. Even when working for others she had a little business on the side but always felt that she was looking for more. CLICK HERE for more information about King Valley Dairy.